All of our cakes are made specially to order and are home baked using fresh ingredients. We realise that you may have questions before you decide place an order with Cakes and Fancies. The following information covers some of the more frequently asked questions, together with our terms and conditions of business. If you have any other questions about our products, or how we operate, please contact Cakes and Fancies by email through our Contact page, or speak to Lesley directly. We are always happy to talk about your celebration ideas. We might also be able to make suggestions that you may not have already considered. Visit our Contact Us page for full contact details. We strive to make sure that all of our ingredients are of the highest quality. For example, we only use locally sourced free range eggs. Our fruit cake, coffee and walnut cake and carrot cakes all contain nuts. Our other cakes and cookies do not contain nuts as an ingredient. However, we cannot guarantee that our cakes and cookies are free from contamination by nuts, either at source, whilst in our kitchen or after delivery. If you or a guest has a special dietary requirement or a food allergy (other than nuts), i.e. wheat, gluten and dairy free, please talk to us and we will try to accommodate your requirements. We generally ask for three months’ notice if you are ordering a wedding cake, or a months’ notice for celebration cakes and cookies. However, it’s always worth asking to see if we can accept a last minute order; acceptance of the order will depend on our work schedule. As all our cakes and cookies are baked and decorated specifically to order, prices vary according to the complexity of the design, and the amount of time involved in creating them. our ‘Simply Elegant’ wedding cake is priced from £175.00 for a two tier cake (1 x 8″ & 1 x 6″ round) and £225 for a three tier cake (1 x 10″, 1 x 8″ & 1 x 6″ round). This is a professionally made, stacked sponge wedding cake (one flavour), covered in white or ivory sugarpaste, with coloured ribbon to match your theme at the base of each tier. It comes on a sugarpaste covered board with ribbon and in a stacked wedding cake box for transport. Perfect for those who want to add their own finishing touches to a home baked and ready stacked cake. We can also deliver. Cake stands and knives are also available to hire. Please contact us for further details, availability and prices. We currently accept payment by cash, cheque and BACS payments. (All payments must be cleared by the time you collect your cake) . 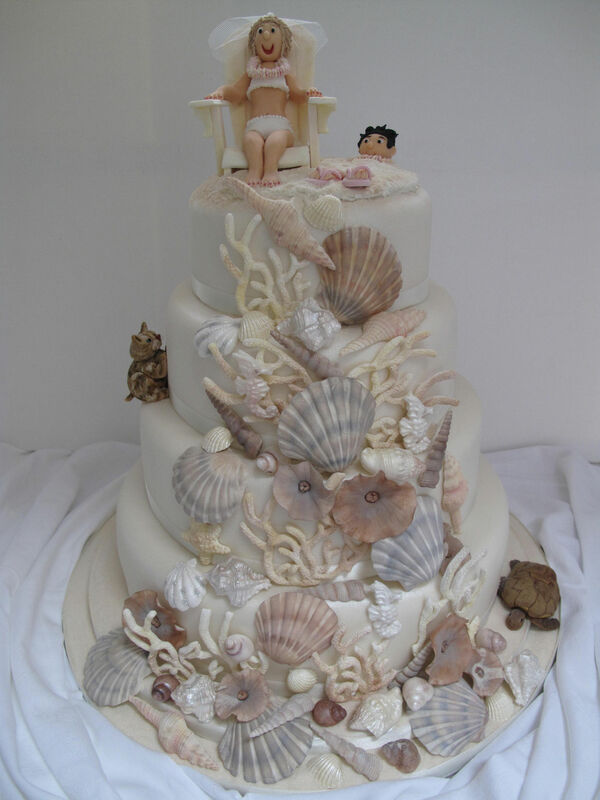 For wedding cakes, a non-refundable deposit of £60 is required when you make your booking. The booking is not secured until your payment is cleared, and you receive confirmation from Cakes and Fancies in writing. The balance of payment is required one month before collection or delivery of your wedding cake. We will send you a written reminder and payment must be cleared before we start your cake. We cannot accept any liability if we are unable to meet your order, due to late payment. For all other celebration cakes and cookie orders, a minimum deposit of £20 is required, when the order is confirmed in writing. The final balance is payable (in cleared funds) on collection, or if payment is made by cheque, the funds must be cleared before collection. Any alteration to the design of your wedding cake must be made at the time when you pay the balance, or within one month of delivery/collection, whichever is the sooner. Any significant alterations to the design may also involve some adjustment to the final price. To ensure that all of our cakes are as fresh as possible, sponge cakes may not be completed until the day before/or the day of the celebration. If you wish to view your wedding cake prior to collection, please arrange this when you pay the final balance. We recommend that stacked/pillared wedding cakes are delivered and set up by Cakes and Fancies at your venue, on the day. Cakes that are going to be displayed as individual tiers will be boxed separately. You can make arrangements to collect these cakes yourself, or we can deliver them and set them up for you. Collection or delivery can only take place once the final balance has been paid. Delivery of a wedding cake must be arranged with an appointed representative from the wedding party, or a nominated person at the wedding venue. Please give us full details of your arrangements. When the cakes or cookies are delivered, we will ask an appointed representative to sign a release form to say that your order has been delivered in good condition. We accept no responsibility for your order after this time. However, if an accident were to happen, we will do our best to help rectify any damage. Delivery charges are included within a 15 mile radius of our address. Outside this radius mileage will be charged at the current HMRC rate, unless otherwise agreed. Where we have arranged to deliver a wedding cake, arrangements for delivery and construction may be subject to change, but we will give prior notice where possible. All other celebration cakes and cookies are to be collected from us at an agreed time. If you are collecting and transporting your cake, we strongly recommend that you place the cake(s) on a flat surface, i.e. in the boot or the foot well of the vehicle, and on a non-slip surface. Carrying cakes on a car seat or lap is inadvisable. Our rich fruit cake has a much longer shelf life than our sponge cakes. A sponge cake will normally keep fresh for approximately four days from the date of delivery, if uncut. Cookies will last up to two weeks from delivery if stored in an airtight container. All of our cakes/cookies should be stored in a cool, dry place and out of direct sunlight. Cakes will be supplied in a cake box or boxes, which will also prevent dust from settling on your cake(s). Contact with any moisture or condensation, which includes rainfall and refrigeration, must be avoided. Any moisture is likely to cause the colours to run and damage cake or cookie decorations. For cancellations made within seven days of the delivery or collection date, the balance must be paid in full. In the event of extreme circumstances, where we are unable to fulfil your order, we reserve the right to cancel your order at any time. In this situation, we will explain the situation immediately and refund any payments already made by you in full; but we do not accept liability for any further compensation. Any equipment we provide on hire, e.g. cake stands, must be returned by the date agreed in writing. If not we will charge you for the additional hire period. Any costs incurred by Cakes and Fancies for damage or breakages to hired equipment will be automatically deducted from your deposit. Cakes and Fancies reserves the right to use images of any cakes or cookies designed and created for its clients in any marketing literature and industry publications. Cakes and Fancies also reserves the right to amend any of the information contained on this page at any time, without notice.